but take a stand based on facts and justice. The hidden obvious has hit the limelight. Horrid stories and black shadows of sexual harassment, abuse of power, and ugly degradation litter our public center stage. The anger is real and justified, but it is not the fuel we need. The danger looms of the #MeToo movement becoming a brief blitz of media sensation. Equality deserves to be more than a passing sound bite. For perception, procedures, and application of equality to be woven tightly and permanently into every fiber of our social and economic fabric we need facts, due process, strategy, and a calm yet loud voice. We will use this current attention to establish permanent change. Channel outrage to create an objective. Of course we are outraged, men and women alike, that it has gotten to this point. Clearly, we do not want inequality. Harassment and abuse based on gender or anything else have no place in our society, workplace, or homes. Yet knowing what we do not want does not move us toward what we do want. We need to set that objective in order to achieve it. Women, like anyone, want to be treated with respect and as equal in all aspects of our lives. That is the goal, not public shaming nor revenge for the sake of it. Let us strategically use the injustice to end it permanently. The suffragettes of the 20th century had the objective to gain the vote for women and faced disregard, harassment, and inequalities that make today’s events sometimes pale in comparison. Yet they had a clear goal, they moved toward it and they succeeded. The German word for equality is Gleichwertigkeit. As often is the case of much German, it consists of two words: gleich which means the same, and wertig which means valued. Literally translated, gleichwertig means of equal value. Every human is of equal value. Furthermore, the genders deserve to be treated as such, whether in income for equal work, decisions made in the home, or having a voice of weight in society. That is what women seek and deserve without having to justify the right to it or having to fight for it. That is simple common sense both genders can certainly follow. What we seek is to balance the scales, not tip them in any favor. Insist on the facts. There is plenty to be angry about, especially if one has been subjected to degrading, harassing, or aggressive behavior. Dealing with the resulting anger, pain, and destruction from being subjected to sexual, emotional, or physical abuse is part of the healing process. That work, transforming that pain and anger, is essential for healing wounds, but it is not the most efficient fuel to create the change we want and deserve. We must define and insist on the facts behind our mutual experiences and demand due process to achieve justice. Based on the facts of the situation, the information you have and the support system you create, decide on the steps to take. Facts are the things we can measure without the personal perception of the events involved - who did what, when: she opened the door first; he picked up the glass; the two people left the room at 11pm. Document for yourself what took place. All the facts. It will not only help in taking action but is a cathartic exercise in itself. When they are defined, use them to state your case and be sure to have a strong system in place to help you move forward. Utilizing facts in a due process will effect change and establish equality and just treatment of both genders, not only one. Stand in power not anger. We want to create permanent change. We want to spotlight an abusive situation, bring a perpetrator to justice, change a system harboring discriminating behavior. Emotion has launched our movement forward. Emotion will give us the courage to take strong action. Emotion will help heal. But emotion alone will not bring justice; facts, due process, and determination will provide the credibility respect and equality deserve. Taking a stance solely from a place of emotion and reactivity, although perhaps justified, erodes the credibility of not only the portrayal of our experience, but of the need of establishing rules and processes, so that harassment and abuse are not the norm. We want respect and equality to be the norm. Fueling the fire with our anger will only cripple justified change. It keeps us in the victim role. When we stand in our power we are no longer “victims” but rather “subjects” of individuals, behaviors, and systems that are dysfunctional, tolerated, and out-of-control. The distinction between being a victim and being a subject is vital. If there were actions you wish you would have done differently, then own that part, your part, of these events. You are not to blame for someone else’s actions. That is the key to remember. You are all powerful in how you deal with people and events. That is what makes you a subject and not a victim. Facts are the tools needed. Due process is our means to have the events brought under a microscope in a fair and thorough way, and determination is our driving force that will assure the change sticks. Be strategic. You are not responsible for anyone’s behavior, only for your own – there you have 100% responsibility. You are not to be blamed for what happened to you, but you have total ownership over what you do with what happened. This is your invitation to stand fully in your worth and your power. Dr. Martin Luther King created radical and lasting change in this country and beyond its borders with his leadership in the Civil Rights Movement. He made it very clear, especially to African Americans who were understandably both defeated and enraged, that people who degrade, belittle, and abuse are not superior by any means. It took great power, control, and strength to walk peacefully in the face of deep discrimination, heated hatred, and open violence. Standing in that place of power and sovereignty, though, is what turned the tide. Dr. King helped us understand that the real power a person has lies precisely in the vulnerability and rawness of our humanity, knowing we are neither inferior nor superior, but simply gleichwertig: equal in value and gloriously intriguing in our differences. That distinction helped him direct a movement toward equality from a place of clarity, power, and love. The result of that turning point is now history. We are poised today to do the same. 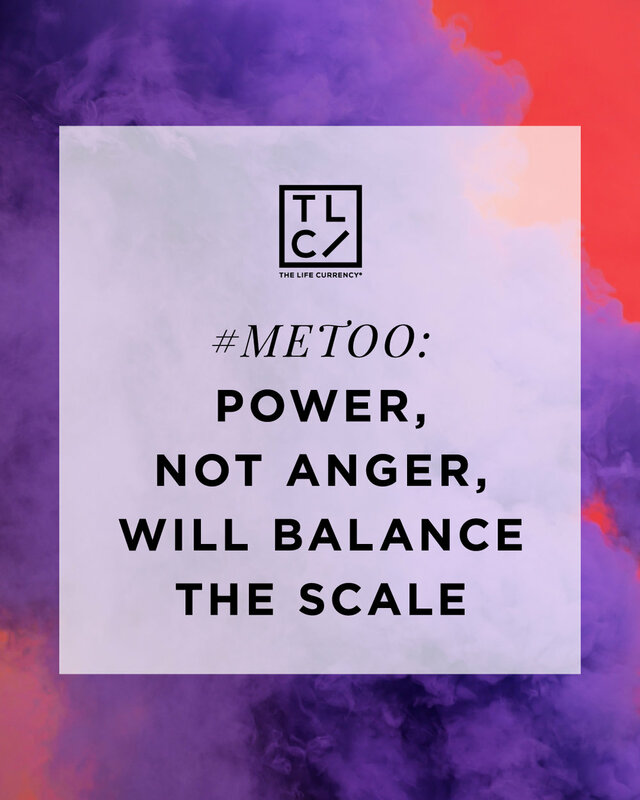 This shift of perspective is crucial for anyone subjected to harassment and abuse and is vital for the #MeToo movement to effectuate societal changes. Every person alive is of equal value – with all respect to and acknowledgement of gender, age, skin color, nationality, size, abilities, orientation, etc. Our humanity assures us of that innate standing. When we truly grasp that any person who is driven to stand above us, who abuses their power or position, treating us disrespectfully or as insignificant, in reality is exposing their own deep-seated sense of inferiority and insignificance, we will have succeeded. If these people actually experienced a strong sense of their own self-esteem, they would have zero need to devalue anyone else’s. It is that simple. On a personal level, owning this perspective of personal power, that being subjected to belittlement does not diminish our value but rather is an invitation to claim it and our equality, will assure our healing process. On a cultural level, championing this perspective will create a societal shift that we have not yet sincerely imagined or of late efficiently pursued. The #MeToo movement is ready, capable, and poised to change history. Bio: Leeza Carlone Steindorf uses her unique approach and powerful message to help individuals and organizations break through their limitations and create radical change. An inspirational speaker, personal transformation trainer, seasoned business consultant, and award-winning author, Leeza is a Women Undaunted Facilitator, trained Tony Robbins Results Coach, Jack Canfield Success Trainer, Mastermind Coach for Steve Harrison, and Mediator.